Whitesell Farms is a small, family-owned operation in North Alabama. We specialize in raising high quality beef for sale directly to the end consumer. Our farm was profiled in the 2016 article, Raising the Steaks, in Alabama Living - boy did that cause a flurry of activity! Our custom beef herd is based on the genetic advantages offered by the Wagyu breed of cattle made famous by the Japanese Kobe beef brand. World famous Kobe beef comes from Wagyu cattle that are raised in the Kobe region of Japan to exacting standards. The Kobe name is protected as an appellation d'origine contrÃ´lÃ©e, much like the fact that only the white sparkling wine from a certain region in France can be called Champagne. Kobe beef are even rumored to receive massages and beer! Our cattle may never meet a masseur, but they do possess the same genetic advantages you find in Kobe beef. Our own tailored finishing regime gives them exceptional marbling, world class tenderness, and great taste! Be sure to "like" our Facebook Page to see updates on availability and activity on the farm. Traditionally the beef we raise on our farm was sold by the side, directly to the public as Custom Beef. This is still an option today, and if you are interested in a side of beef for which you have full control of the processing, please have a look at the Available Supply link to the right. Also, we are committed to traceability - and if you have an animal ID from one of our products and want to find more information about it, the Available Beef Supply table is the place to start. The arrival of 2018 means that we are now in full production with 70-100 animals processed for beef each year. Our USDA Federally inspected beef is distributed in a variety of options including individual cuts, small boxes, and ready-to-purchase boxed eighth, quarters, and halves through our subsidiary, North Alabama Wagyu, LLC, at Farmers Markets in the area. 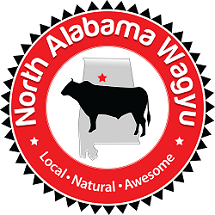 Visit our newly released North Alabama Wagyu web site for more information. Check for dates & locations. Since 2017, we have been providing beef to one of the finest restaurants in Huntsville, Alabama. At Cotton Row Restaurant, Chef James Boyce is working our USDA Federally inspected steaks, roasts, and ground beef into his original menu. We couldn't be more honored to be part of this team. Visit our Cotton Row Restaurant Landing Page for more information. Hamburgers on menu every day, steaks and other creative dishes as supply allows. Since 2017, we have worked with the locally owned Cajun Cleaver in Birmingham, Alabama to offer USDA Federally inspected steaks, roasts, and ground beef through their specialty meat counter. This is a great shop with a lot of personality and we felt right at home talking with Nick about our beef. Visit our Cajun Cleaver Landing Page for more information. In Stock as demand allows.